I wanted to return to provide an update on the Ovleng stereo headphones. They worked well. I consistently had good sound from the headphones. The headphones took almost daily use for the past few months. The microphone recorded excellent voiceovers for my YouTube channels. My problem is that they died without warning a few days ago. Usually there is static or other indications that something is wrong. Not this time. I picked them up to use the headphones and found them completely dead. Taking the cover off revealed some of the horsehair thin wires had broken off inside the earpiece. None of them look big enough for my soldering skills, so the damage will have to stand. I'm turning back to Amazon for a sturdy pair of headphones. Leave me a comment if you have a pair that you like. None are off the table. I'll let you know as soon as I find a pair that I like. Another college student suggested getting a set of good quality stereo headphones along with the rest of my college gear. But, I forgot and there was no way I was going to fight my way back through the campus bookstore just for a pair of headphones! Amazon came to my rescue. This Ovleng stereo headphones review covers what I like, and don't like, about them. Skype calls are crystal clear and, although they aren't noise canceling, they do a nice job of blocking out most of the dining hall hum. I really like the overall sound for music and recorded notes. 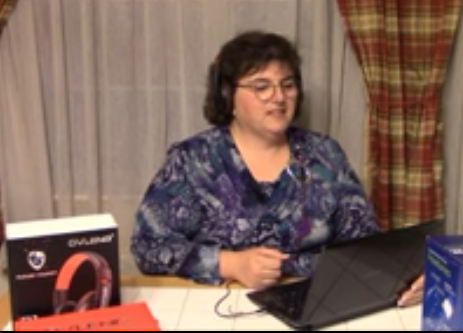 Here is the video unboxing and Ovleng stereo headphones review that I did on You Tube. They make several different styles. I'm not a tech person, so you'll want to click below to get the technical details on the different models. After doing the unboxing and Ovleng stereo headphones review on YouTube, I decided that I don't like the bulk they add to my book bag. Also, they begin to get uncomfortable after a couple of hours on my small ears and I need to take a break. Otherwise, I love these stereo headphones and much prefer them to ear buds or foam headphones. In the interest of full disclosure, I want you to know that these were purchased at a discount for an honest review. As a nontraditional college student on a limited budget, I need to save money whenever possible. Just know that a discounted or sale won't buy a good review. I like what I like, but if a product is junk, then I'm going to say so. I hope you like the review as much as I like the Ovleng stereo headphones. Don't forget to share the post on social media and leave a comment below to let me know of any tips you have about surviving college.